It’s a funny old thing, looking back in time, but I always remember from an early age being asked to read aloud, address an audience, and be the compere, one way or another. I suppose the performer in me might have had a lot to do with it, and that is why being a celebrant is so wonderful, feeling honoured to be part of a couple’s Big Day, one that hopefully will not be forgotten. Normally my couples have done the legal side of their Marriage in a quick in-out official process, often completely lacking in magic. So here in the Mallorca sunshine, in a beautiful location, I can make it The Wedding to Remember, which everyone wants their wedding to be. 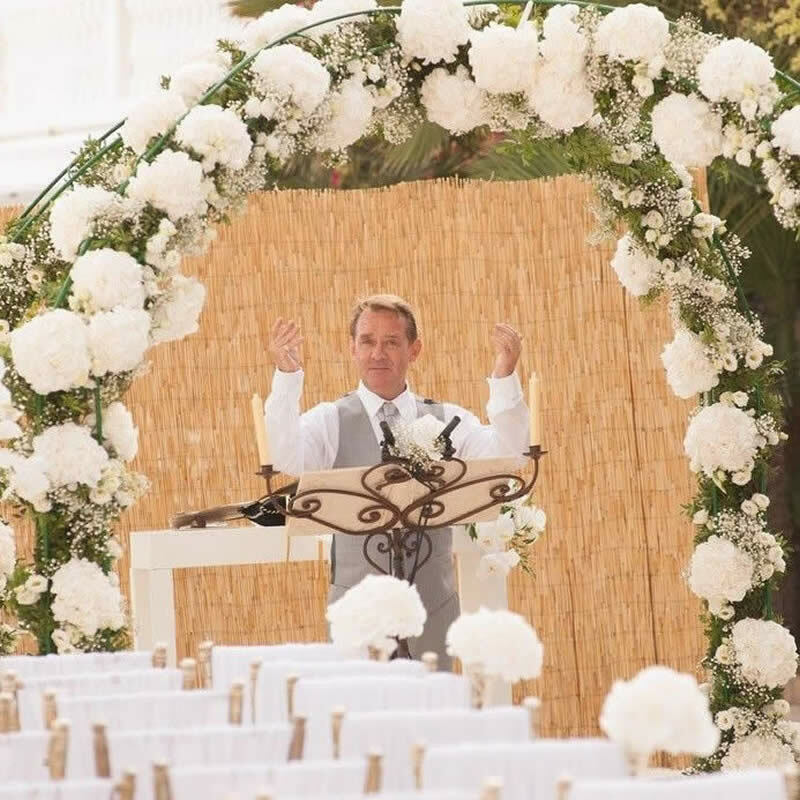 I will tailor the ceremony to suit your dreams – the style and tone of the service will be especially created to reflect your wishes and personality. 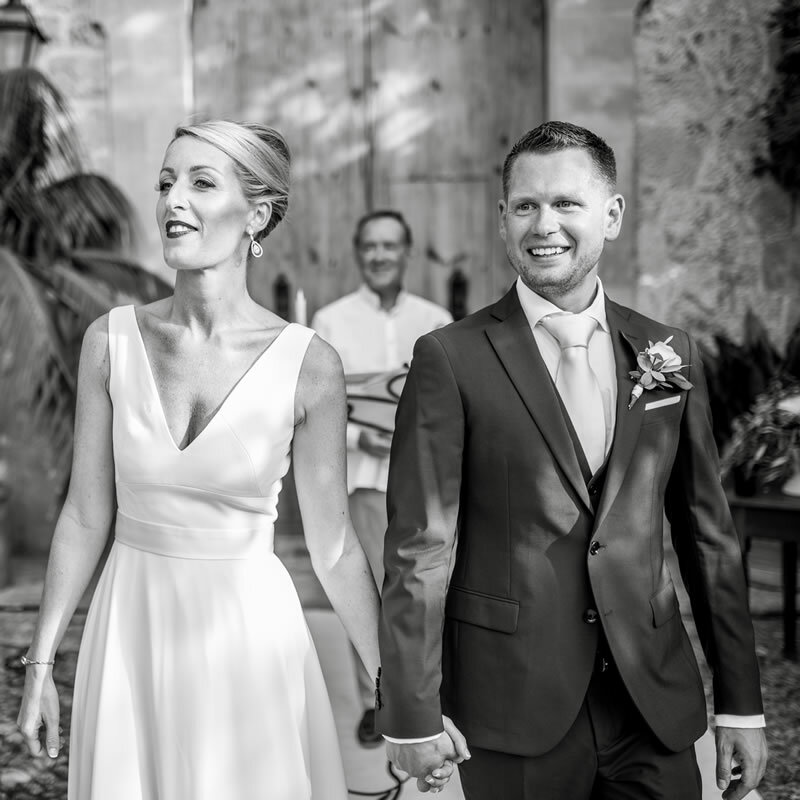 I have had the privilege of officiating at some of the most beautiful venues here on Mallorca, from magical fincas to some of the best hotels, and I have developed close relationships with many of them, including the Hilton, the St. Regis Mardavall, the Nixe Palace, Castillo Son Vida, Cap Rocat, Hotel Formentor, Park Hyatt, Son Marroig, Villa Italia, and the exotic Jumeirah Hotel in Puerto Soller – this year I even had the pleasure of performing the wedding of the Jumeirah Hotel’s Events Director, Flavia Salambier! To date I have married couples from all over the world, embracing many cultures and ethnicities. In the coming season I have couples coming from as far afield as Canada, the USA, New Zealand and Australia. It’s a funny old thing, looking back in time, but I always remember from an early age being asked to read aloud, address an audience, and be the compere, one way or another. I suppose the performer in me might have had a lot to do with it, and that is why being a celebrant is so wonderful, feeling honoured to be part of a couples’ Big Day, one that hopefully will not be forgotten. I will tailor the ceremony to suit your dreams - the style and tone of the service will be especially created to reflect your wishes and personality. I have had the privilege of officiating at some of the most beautiful venues here on Mallorca, from magical fincas to some of the best hotels, and I have developed close relationships with many of them, including the Hilton, St.Regis Mardavall, the Nixe Palace, Castillo Son Vida, Cap Rocat, Hotel Formentor, the newly opened Park Hyatt, and the utterly magical Son Marroig. I am honoured to be recommended by them. To date I have married couples from all over the world, embracing many cultures and ethnicities. In the coming season I have couples from as far afield as Canada and the United States of America. And I too will be traveling - to marry a couple in Berlin, Germany.